Evidently Basque has two valid words for pear. Both Basque words contain "dar", so I used those letters when making my Miresua word. I decided to make the final letter ä (a umlaut), because the Finnish word contains three of them. I’m watching the Clipper game right now, and I’m not happy. Going to write this to take my mind off things. Yesterday’s episode, “The Ghost of Harrenhal”, was a bit easier to watch than last week’s. Or, at least if you’re not a fan of Renly who wasn’t familiar with the books. If you are, well… Props to the fallen. Big ups to Gethin Anthony for portraying a Renly Baratheon that I think all of us were really coming to like. For myself, I could really see him as the likable character he’s supposed to be in the books. I didn’t see that so much in the books. Gethin Anthony did a fantastic job, and he will be sorely missed. Let me step out for a minute to say that I just saw one of the most ridiculous comebacks I have ever seen. I could see the Clippers maybe making a run. But winning that game? Are you kidding me?! Unbelievable. Memphis is not going to enjoy looking at the film of this one! But yeah, back to Game of Thrones. I like Jaqen H’ghar. I like Brienne and Cat. I like Pyat Pree. 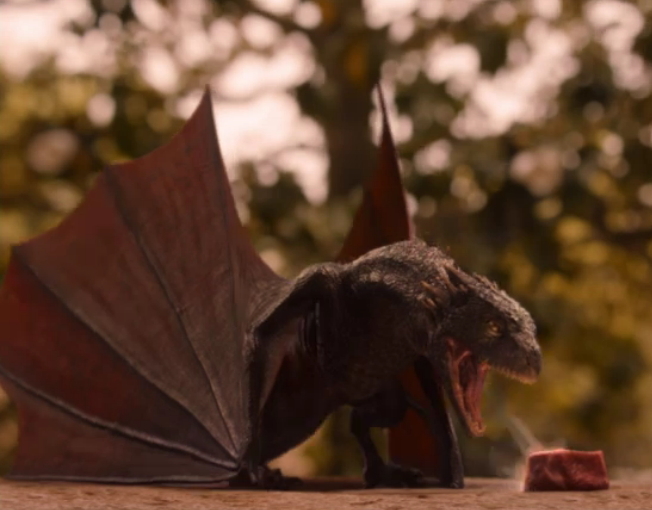 And I like Dany teaching her little dragon how to eat. More of that please! But before getting into Dany’s scenes, a quick note about the translation of the title. There are a couple of ways to do “The Ghost of Harrenhal”, and I decided on the ablative for two reasons—first, it could be “The Ghost From Harrenhal”, which gives a bit more of a locative feel than the genitive would, and also because it makes it sound like Harrenhal is an entity, and that the ghost is a part of its body. I kind of like that, so I went with the ablative over the genitive. And, of course, the word for “ghost”, lei, got its form from the fabulous Leigh Bardugo, whose debut novel Shadow and Bone is coming out this June (look out for it!). Anha soqe akka jin sacchey essheyi. We have, I believe, a new word in soqat, “to weave”, and following it up with akka renders “to reweave”. The word saccheya (seen above in the accusative) derives from the root sach, which gives us words for “half” (sachi, class B) and “to divide” (sachat). With the part-to-whole morphology, you get kind of a part of a half (literally), which becomes a very general word for a part or a piece of something. You’d use the same word (saccheya) for a piece of pizza, a piece of pie, a part of a story—or, if the Dothraki ever developed mathematics, for a word for “fraction”. Then the word essheya (above in the genitive) is formed using the same pattern off of the root she, which is a general locative preposition that most commonly means “on” or “on top of”. Qisi tim, anha arrisse vemishikh jinoon akka. Literally, though, that begins with “Regarding the boot(s)”. So there you go, Hrakkar! A Dothraki word based on your name made it onto TV. Thanks for all the help at WorldCon (which, by the way, it currently looks like I will be returning to this year. I’ll likely have more details later). In fact I had to kind of throw that in, because the line was rewritten. Originally it had the word “boot” in the line, but all that remained was “heel”, so I kind of shoehorned (if you’ll forgive the pun) the word “boot” back into the line, and it made the cut. Hoorah! The word for “heel” is kind of fun. It starts with vem, a word that means either “elbow” or “knee”, depending on contexts. From that we get vemish, which means “heel” (both of the foot and the hand [the part you hit the board with if you're doing a palm strike]), and then from that we get vemishikh, which is kind of like “artificial heel”, or, specifically, the heel of a boot or shoe (and this one just refers to the footwear, really, since gloves don’t have an equivalent part that’s equally important). Me dothralates she Rhaeshi Ajjalani ayyeyaan. Last week we got caught up talking about the jussive because I confused the terminology, but the use of dothralates above is a true jussive (used optatively here). Chaki, chaki. Khaleesi jada. Me vakkelena jin. Kisha nevaki mae! Yer laz vos vefenari mae, vos tavi mae, vos ivvisi mae. Vosecchi, zhey khaleesi! Kisha vayoki athezaraan kishi. Kash athezar kishi vos akka. Hash idrik kishi vijazero kisha Athasaroon Virzetha hash yer zali zifichelat moon? Anha acharak vos alikh. Of this, well…Dany’s pronunciation of “alikh” was spot on! But I think everything after Athasaroon got cut off, and a stray kishi was inserted somewhere. So it goes. So, maybe this has been answered somewhere else, but how would you render “When you play the Game of Thrones, you win or you die” in Dothraki? I can get the rest, I think, but the only word I see for “play” means playing a musical instrument, so it’s driving me crazy. Hash yer lajie ki Vilajeroshi Adori, hash yer che najahi che drivoe. I decided to use the present tense here rather than the future tense to make it more of a “when…then” phrase as opposed to an “if…then” phrase. Somehow it seems like the present does a better job of that than the future. Halfway! Only five more episodes of season 2 of Game of Thrones. Been good so far! See you all next week. siath (noun): calf, young cow. All verbs had the non-past positive and negative forms mergina, while the past forms remained distinct, so I extended the past tense negative forms to cover non-past as well (essentially creating a tenseless negative form and avoiding the need to create a negative particle. Vocabulary words have appeared in various other posts. Here are some more nouns beginning with "V" in each of the three noun classes. The LCS is looking for three experienced conlangers to serve as reviewers for an upcoming job announcement. The review process should take one day, but will likely be a full day. Please e-mail jobs “at” conlang “dot” org with links to your conlanging work and/or conlanging work attached. You are currently browsing the Conlangers blog archives for April, 2012.